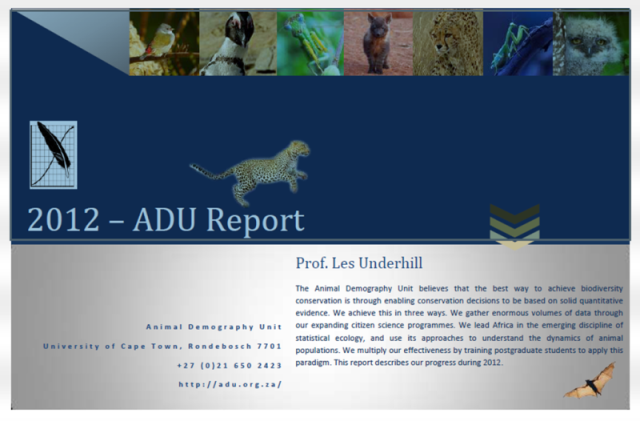 The Animal Demography Unit believes that the best way to achieve biodiversity conservation is through enabling conservation decisions to be based on solid quantitative evidence. We achieve this in three ways. We gather enormous volumes of data through our expanding citizen science programmes. We lead Africa in the emerging discipline of statistical ecology, and use its approaches to understand the dynamics of animal populations. We multiply our effectiveness by training postgraduate students to apply this paradigm. This annual report describes our progress during 2012. Read about all the projects at the ADU, including weaver research!